Our dear friend and community member Adam Shapiro died in his sleep at his apartment in mid-September. He was 61 years old. Adam was a beloved member of the Mercy community. Our only member who was blind or Jewish, he brought a unique and welcomed perspecitve to our Bible studies, thoughtfully engaging Biblical stories and pushing us all to concretely engage the lessons at hand. 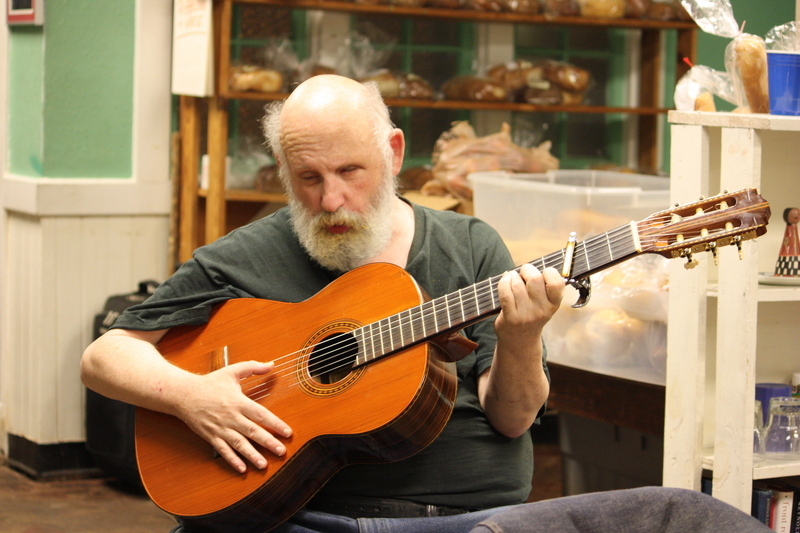 A talented musician, Adam frequently regaled us with folk and labor songs during our services. With an understated gusto, he picked away at these traditional tunes on his classical guitar and taught us the choruses so that everyone might participate in the songs. A favorite and definite crowd-pleaser was his original composition “Cool Like That,” a song he wrote about Mercy. He also learned Mercy songs, playing by ear and preforming with the rest of the Mercy band. We are grateful to his sisters who gave us his guitar after he passed; his music is still with us. A frequent contributor to the Mercy and Atlanta Overlook newspapers, his poignant and insightful articles will be greatly missed. Adam truly understood the importance of being an advocate and, more importantly, an ally to those on the margins. We miss Adam: his wit, wisdom, and heart.